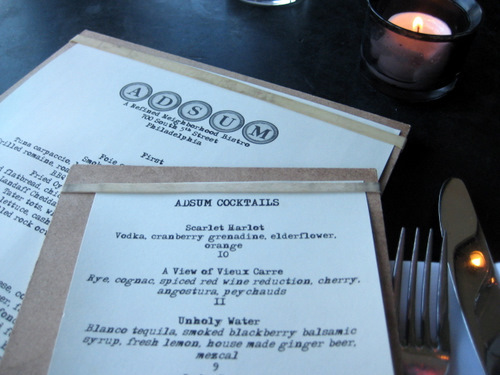 Adsum has been getting mad press since even before it opened. Remember this Philadelphia Magazine article? Good press or bad press, eventually, even I had to check it out. It was kind of a ridiculous idea though, since I’d just gotten back from a trip to New Orleans, and I certainly should have had my fill of southern food. But I had to persevere! We tater tots. Ok, ore ida tots these were not. These were super crispity and served with whiskey, bacon, whipped ranch, cheese, and some fish eggs. 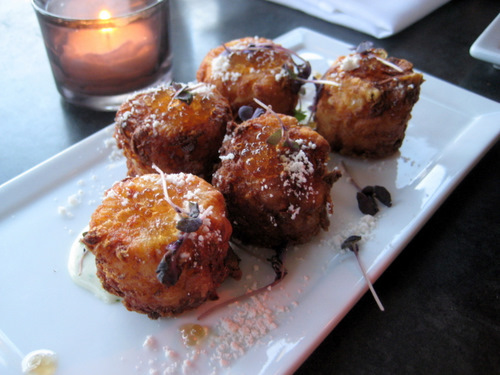 Tater tots may not be all that good for you, but these certainly tasted good. So we did not order the octopus, but it showed up. They had gotten the order wrong, so they gave it to us anyway. Which was actually a good thing because I had actually wanted to order it, and because it was delicious. 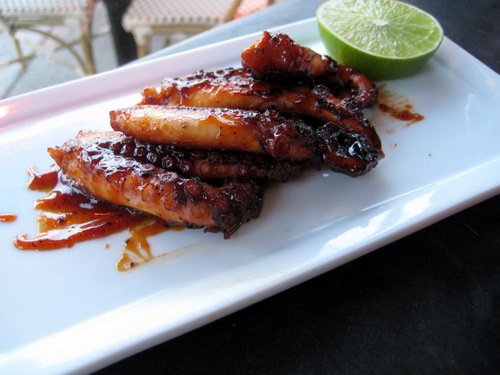 It was grilled rock octopus with a black pepper caramel. It was totally melt in your mouth and sweet and delicious. 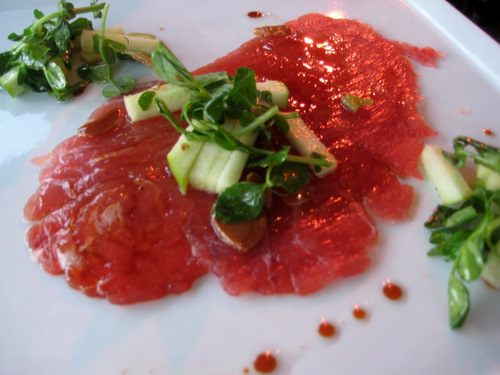 Here we have the tuna carpaccio. Wow, this thing was super fresh and delicious. And I would never have thought about putting raw tuna and apple together, but it totally works! It also had fried garlic and soy sauce. 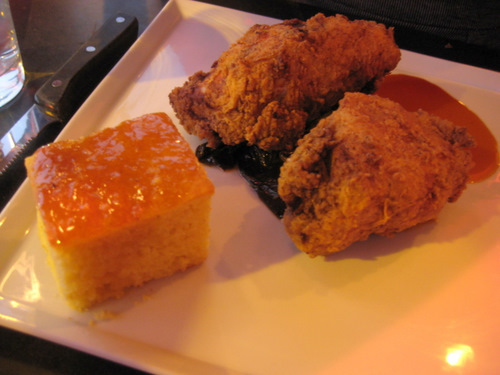 We E got the fried chicken with collard greens, ham hocks, corn bread, and hot sauce. The chicken was good, but man, these greens were awesome! Totally not bitter at all, and savory and sweet at the same time. I got the scallops and damn, were these diver scallops ever huge. I definitely did not expect four of them, and I certainly did not expect them to be so ginormous. 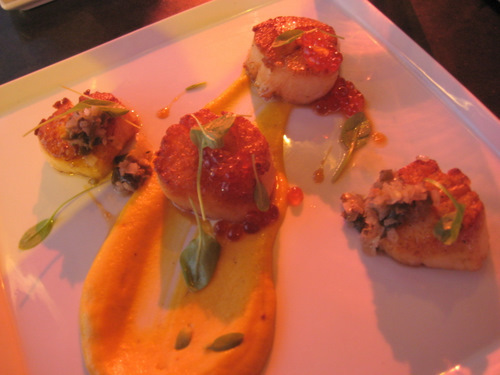 There was a butternut squash puree and the scallops were seared with a butterscotch sauce, so they were a bit sweet. The scallops were topped with fish eggs and chopped jalapenos. They were perfectly cooked and I thoroughly enjoyed them, like this entire meal and experience. The place is worth all the hype and press and our server was an absolute sweetheart with a mysterious accent. Go check it out for yourself!